Since I did not post for a while, I have projects that were started and completed without a mention on the blog. 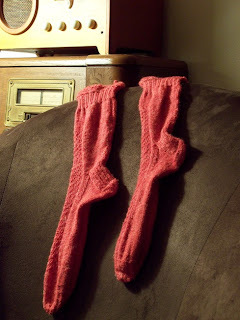 The socks below are one such project. I bought the yarn because it contains bamboo and I love red. Our mascot here where I teach is the Cardinal. So these have become my "team spirit socks".